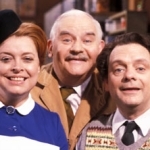 Where is Open All Hours filmed? Albert Arkwright wants to make plenty of money and speed very little of it. When he's not in his shop, Arkwright devotes most of his energy to the pursuit of Nurse Gladys Emmanuel played by Lynda Baron, who lives across the street. Granville played by David Jason, is never allowed to experience life beyond the boundaries of his delivery route.